All instruments are for sale. 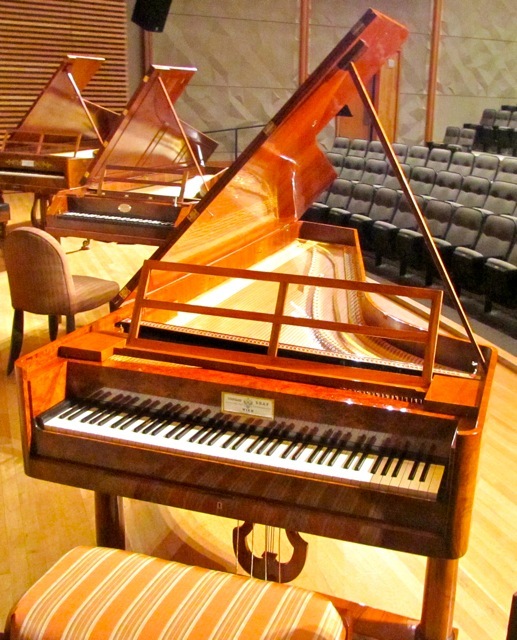 If you are interested in any of these instruments, please contact us. Keyboard Range: CC-f'''', 246 cm long, 125 cm wide, 64 cm corpus thickness. The book-matched, walnut-veneered cabinet rests on three, column-like legs. 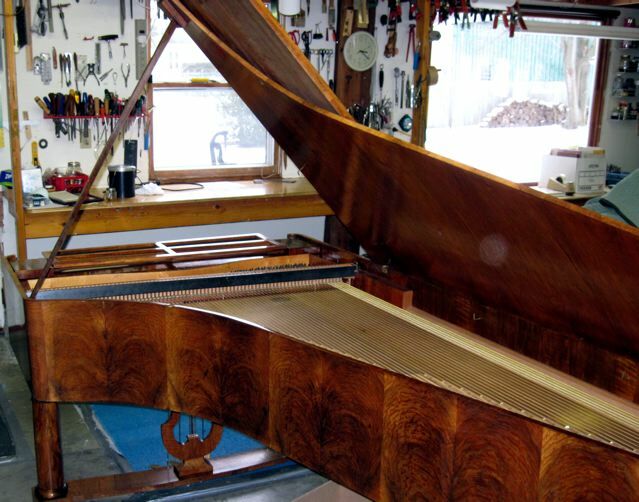 The front legs are connected by a stretcher carrying the lyre and pedals. 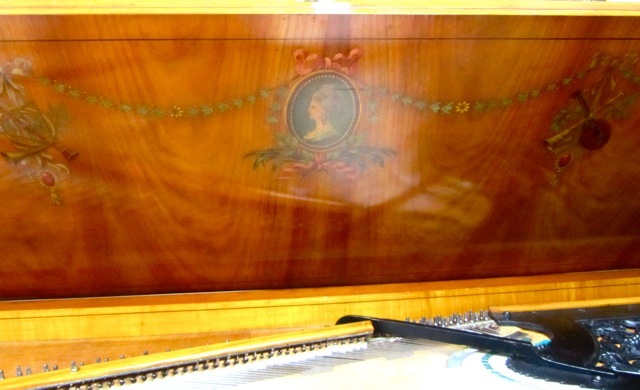 The cheeks of the cabinet curve inward toward the player. 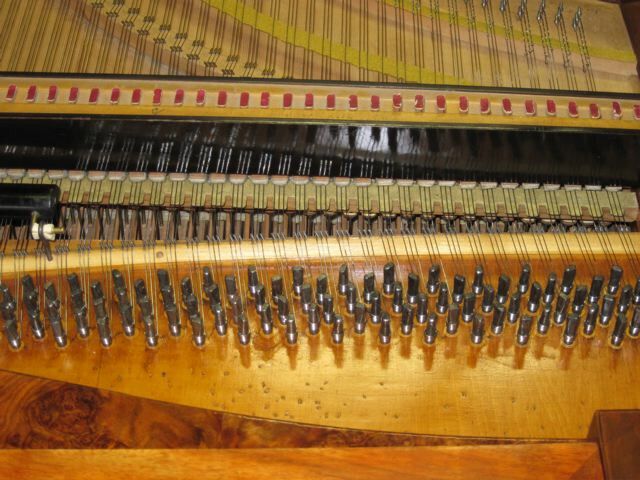 There are four pedals: keyboard shift, bassoon, moderator and damper lift. 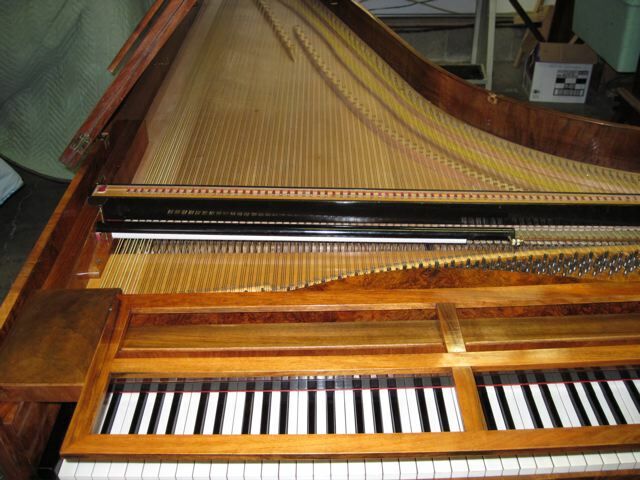 The original hammers, dampers and moderator are original and in excellent condition. The structure is in excellent condition with no warping. 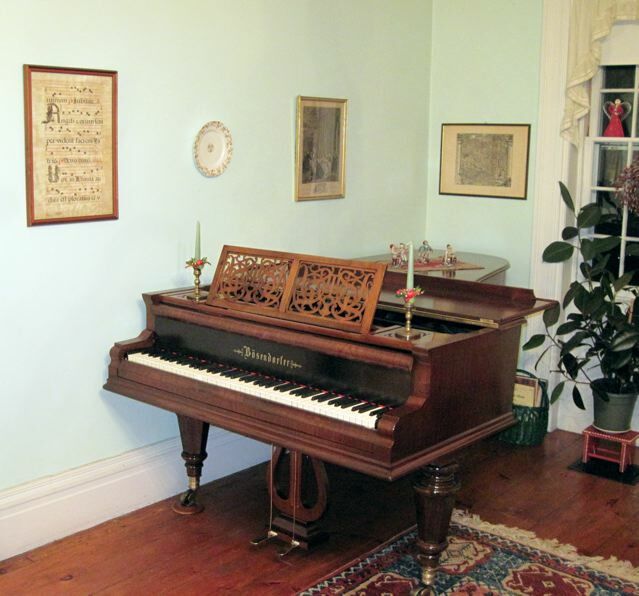 The instrument is tuned to A=430. 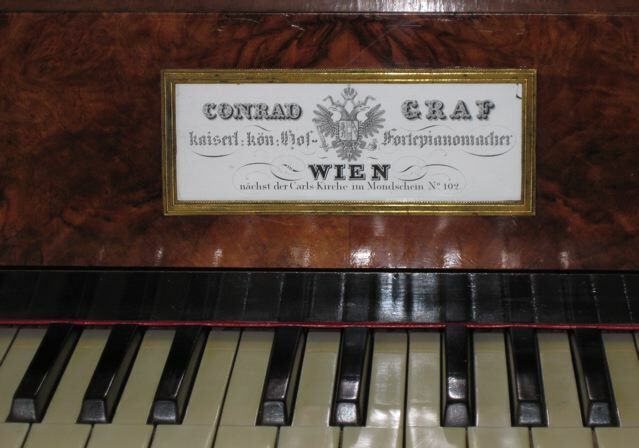 Conrad Graf was the most famous piano builder in Vienna in the early 19th century. 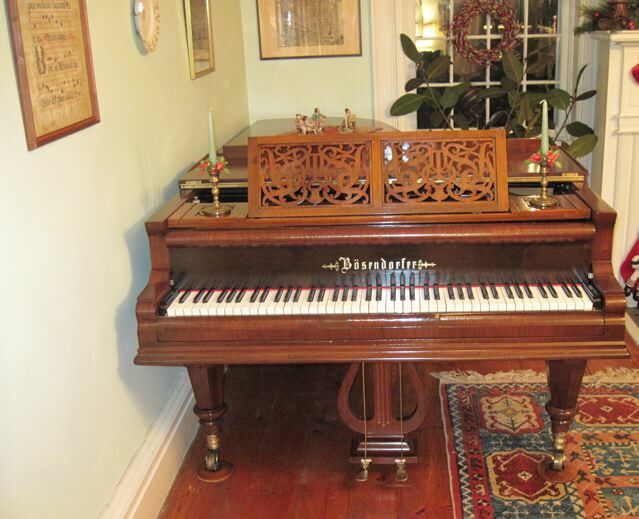 His instruments were owned and admired by Beethoven, Robert and Clara Schumann, Chopin, Brahms, Liszt and many others. Price available on request. 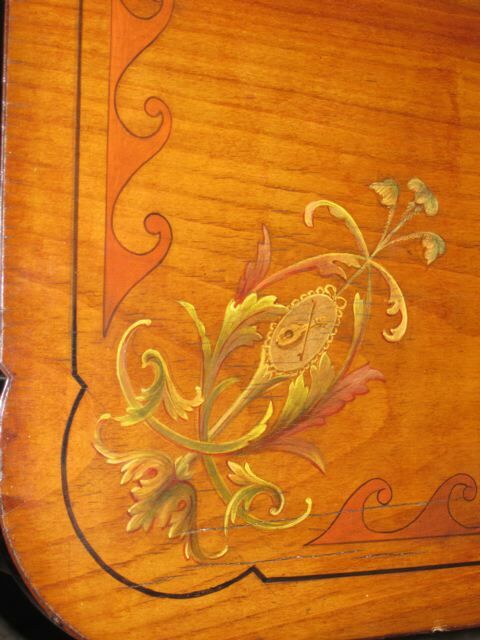 This unique instrument was probably commissioned by a noble family whose female members may be represented in portraits, along with floral designs and musical instruments that are painted on the instrument. 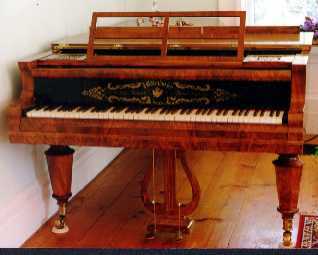 There are four decorated, hexagonal legs, 1 brass pedal attached to a lyre, and a partial cast-iron frame. 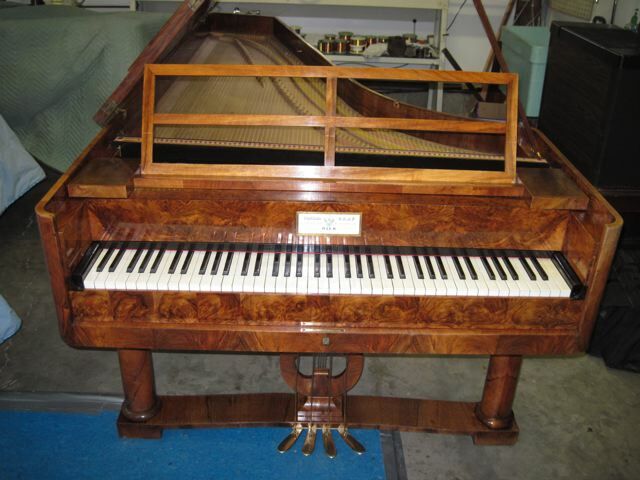 The dimensions are: 188 cm long, 82 cm wide, corpus width 31 cm, total height 86.5 cm. 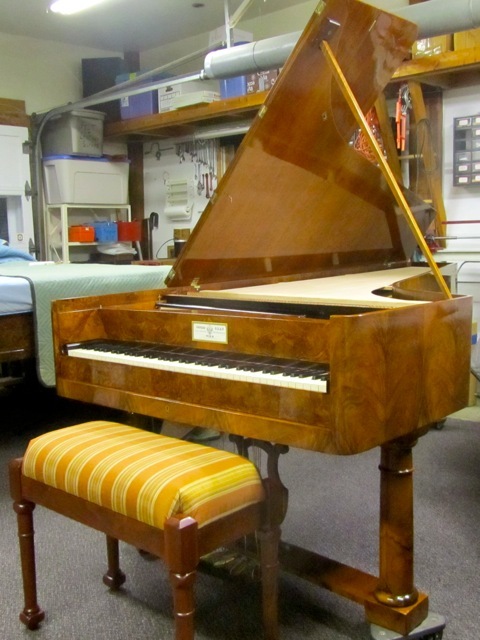 Completely restored to playing condition. The instrument has a crisp, clear sound and an excellent bass. 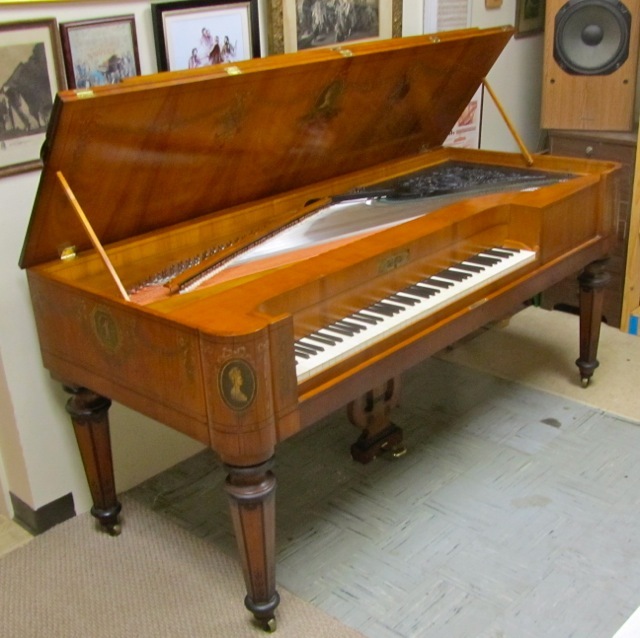 Restoration complete. 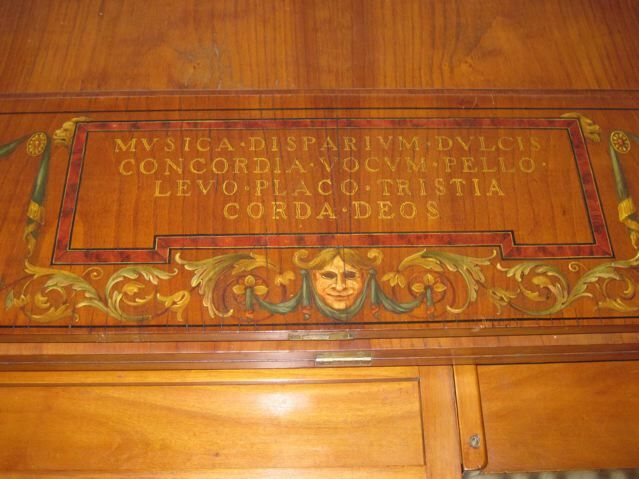 The photos below show the beautiful cabinet before restoration. 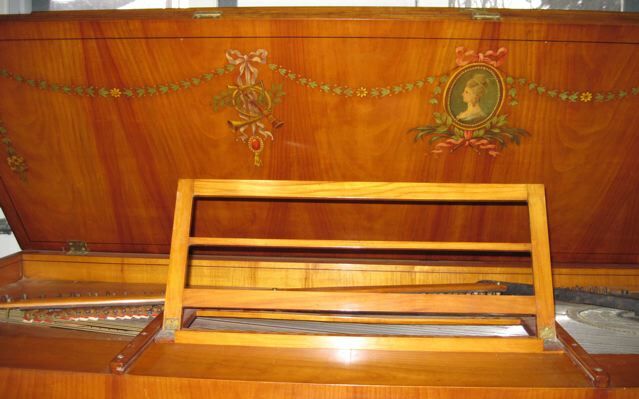 Seven-octave concert grand fortepiano with a Viennese-action (Vienna, c. 1850). 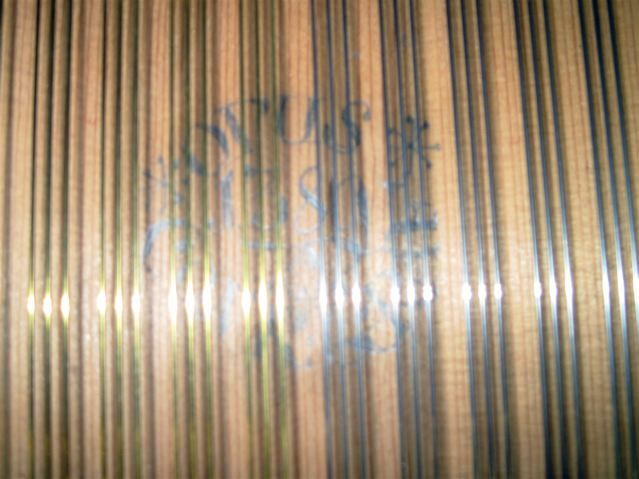 Signature inlaid in brass on the name board: K.K. 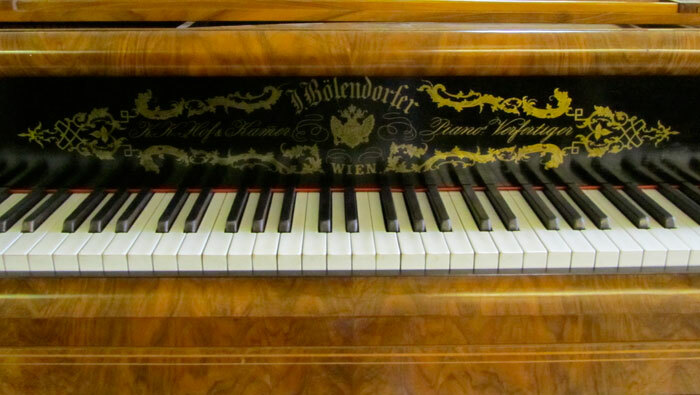 Hof & Kammer [Austrian Double eagle] Piano-Verfertiger/Wien. Number 3881. 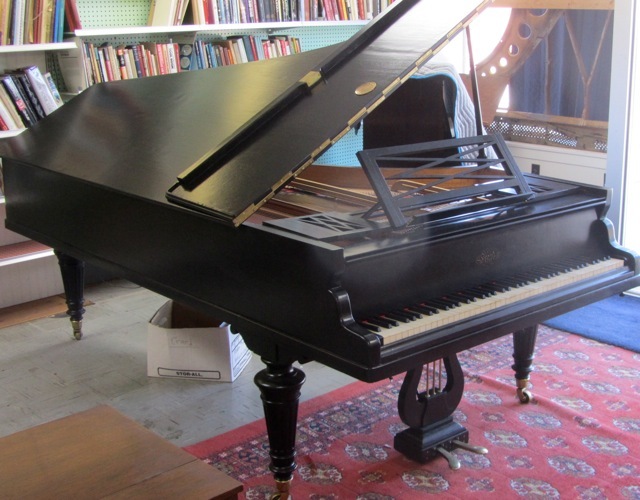 Perfect ebony and ivory keyboard. Lovely book-matched burl-walnut cabinet. The hammers and dampers are original. 7' 8" long, 47" wide. Fully restored. 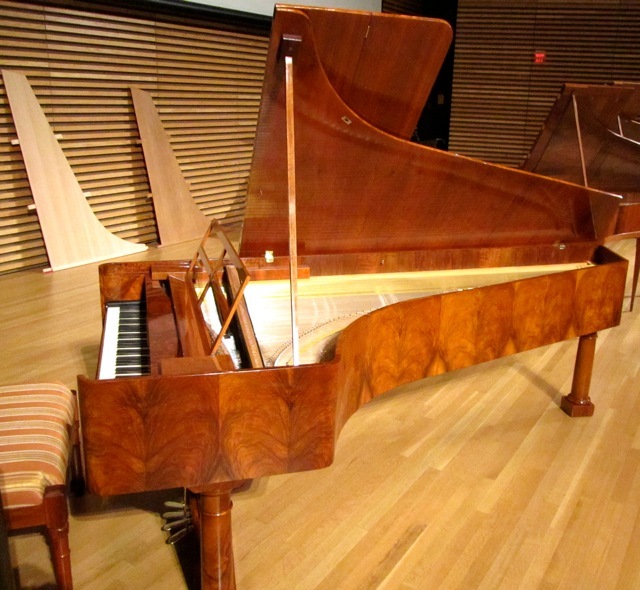 This instrument is featured on the Harmonia Mundi recording of Johannes Brahms's Horn Trio, op. 40 (HMU 907037). Provenance: Lambach, Austria. 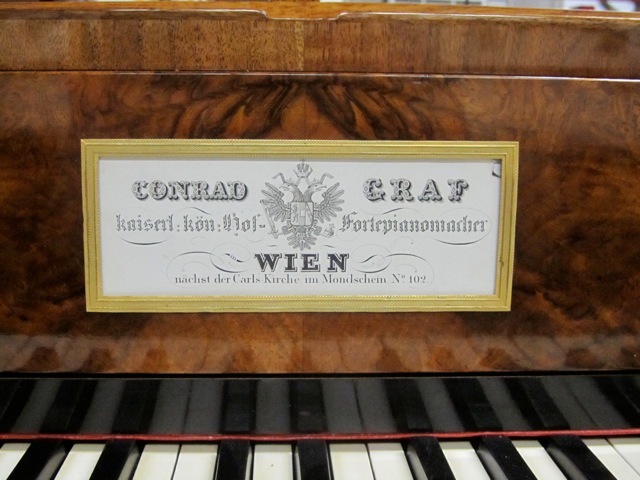 Concert grand fortepiano, number 6241, Vienna, circa 1862. 7' 8" long and 55" wide. 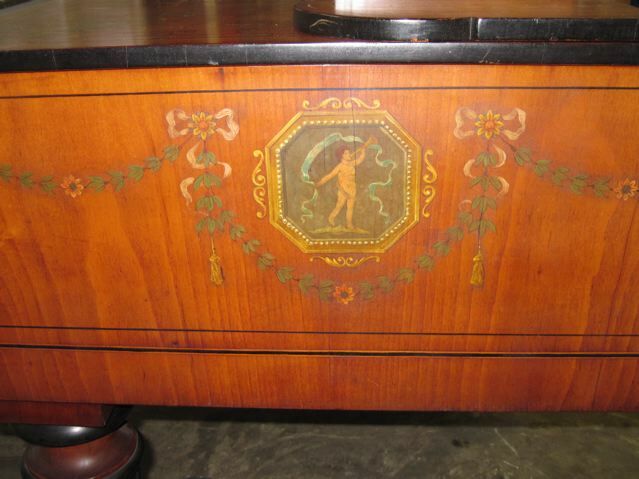 The cabinet is mahogany with the maker's name inlaid in brass on an ebony wallboard. 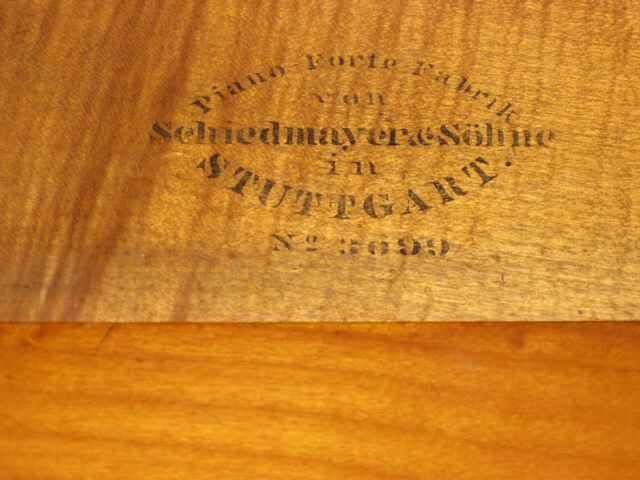 Signature on the fallboard: Bösendorfer. 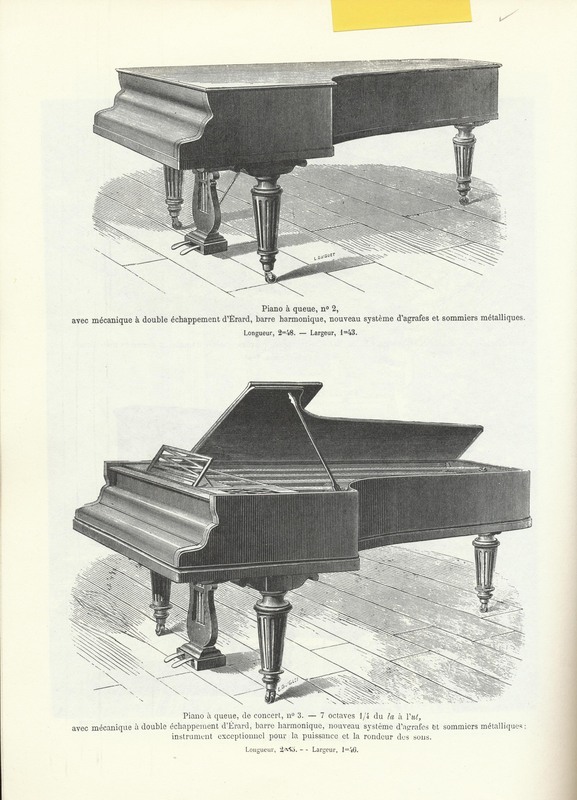 On the soundboard: L. Bösendorfer/Kais. Bras. 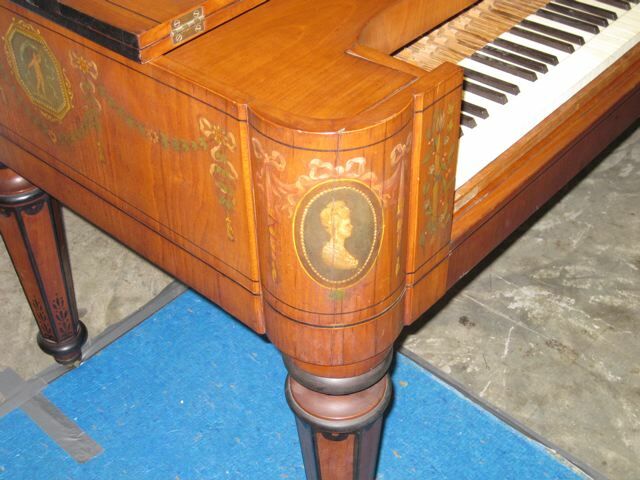 Hof Clavier-Macher/Medaille/General Excellence of Pianos/1862 Londini/Honoris Causa/6241 Provenance: A castle near Udine, Italy. The inner rim is in maple. 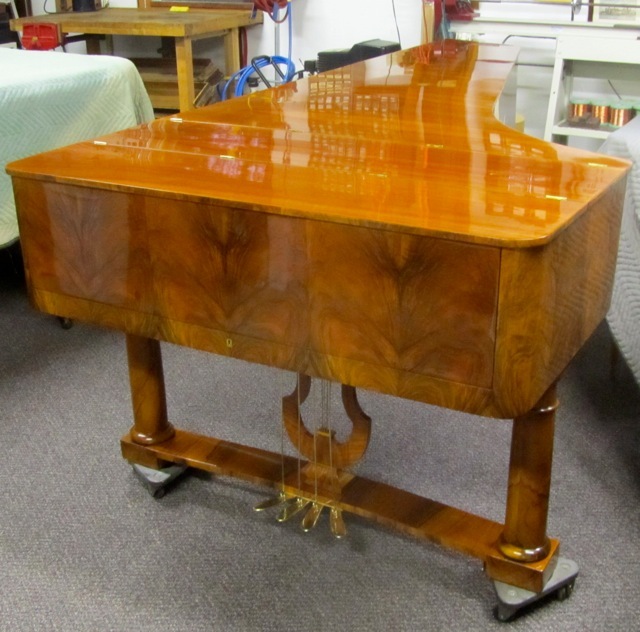 Simple, elegant mahogany cabinet with elaborate music desk. 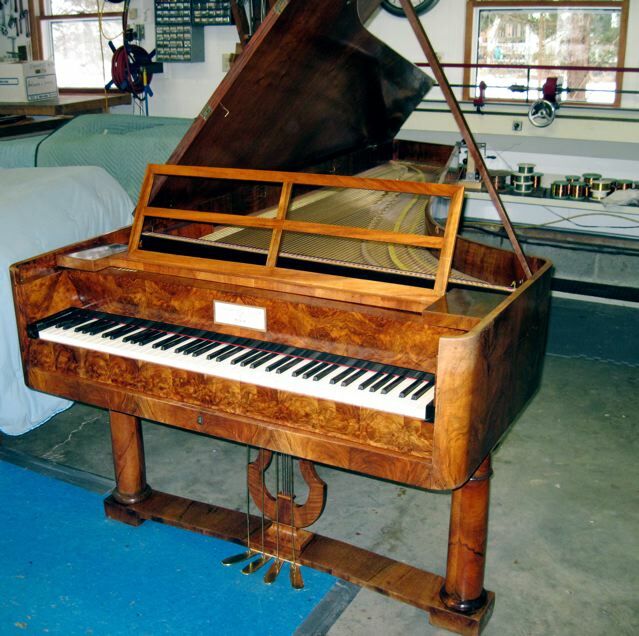 Completely restored: The original hammers were re-felted in Paris, new Erard dampers, new strings and tuning pins. A superb instrument with a powerful, clear and pure tone.